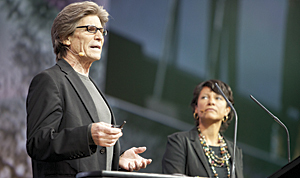 Tim and Michele Schilling provided a keynote presentation at the 2011 Esri International User Conference afternoon Plenary Session. Tim Schilling is director of the United States Agency for International Development (USAID) Rwanda, and Michele Schilling is a professor of ecology and GIS at the University of Rwanda. Tim Schilling, director of United States Agency for International Development (USAID) Rwanda, and Michele Schilling, professor of ecology and GIS, University of Rwanda. Rwanda is in east Africa. Project Rwanda was initiated to improve the economy of the country and the income of its farmer families. The country has about 500,000 coffee farms. In 2000, this coffee was not of a quality to attract world market attention. The Schillings brought individual farmers together and developed a method and standard that would enhance the quality of their coffee to be one of the world's most outstanding. By improving quality, they raised demand, allowing the farmers to raise their prices and, in turn, the economic levels of the country. What caused farmers to participate? The Schillings worked to get funding to build a coffee cherry washing station, which brought the community together in a venue wherein they sorted and selected the best cherries (also called berries) and created a quality standard. The coffee industry was enticed by the consistency and flavor of this coffee and purchased it through Rwanda's Green Living Project. The project began to grow, and the Schillings sought to place more berry washing stations in the surrounding regions. Working with the university, Michele developed a sophisticated geographic model for site analysis. One input was a sensory profile of the coffees' characteristics, including finish, body, and taste types, much like the wine industry does. These profiles were used to categorize coffee cherries, and then these were linked to the regions that produced them. The next part of the analysis was to determine which variables in those regions might be the cause of the coffees' characteristics, such as soil pH, water, temperature, and elevation. Michele used statistical modeling to isolate growing conditions attributed to coffee characteristics and then located these conditions in the surrounding areas, plotting them on a map. The Geography of Coffee map shows coffee characteristics by region, such as East, North Kivu, and South Kivu. Next, Michele used GIS to perform a proximity analysis to determine the best sites for washing stations. The Schillings provided this information to potential investors. Part of the program was to educate Rwandans to evaluate the quality of their coffee, so coffee specialists were brought in to train the locals. Farmers adopted new farming practices to produce a high-grade cash crop. Starbucks began to buy coffee directly from Rwanda, and the country's exports took off. Annual income—the equivalent of US$500/family in 2000—grew to the equivalent of US$3,000/family by 2010. The university tracked the success, showing that farmers who followed this coffee model had business returns that grew 82 percent faster than nonparticipating farms. The Global Coffee Quality Research Initiative has been launched to extend the Rwandan coffee marketing model to other coffee-producing countries in the world. Readers can follow the growth of the Global Coffee Quality Research Initiative by following the blog at gcqri.org.